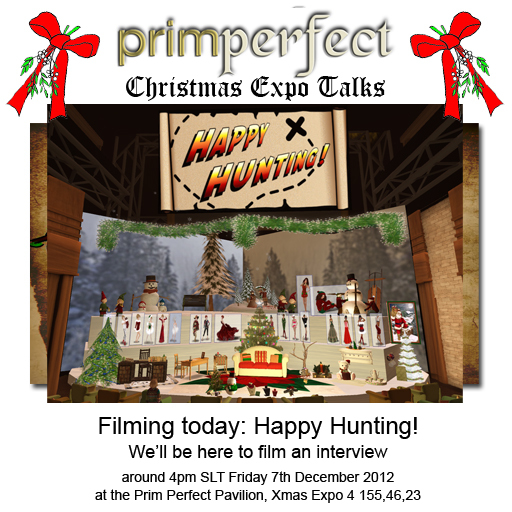 No talks today at the Expo – but we will be filming an interview in the Pavilion at around 4pm SLT for next week’s edition of Happy Hunting! – and you are very welcome to come in, take a seat and watch. We’ll be back tomorrow with two talks – at 3pm we’ll be talking to Auryn Beorn, the amazing scripter who will be showing us some sames of her incredible work – and at 5pm Isla Gealach, the owner of Cheeky Pea and the Nest. Previous Post: Prim Perfect Jigsaw – Can you find us at the Christmas Expo? Next Post: Prim Perfect Jigsaw: Start the Race for the Bells!